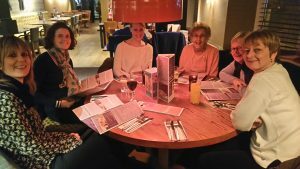 The evening home group enjoying a meal out together. Home groups take place on the 1st and 3rd Wednesday afternoons in the Peter Apted Room and on the 2nd and 4th Monday evenings at 8pm in a private house. Please use the contact page if you are interested in joining us. We believe that God wants to meet with each one of us, and that through reading the bible, praying together, and discussing how we can live as Christians, we can encounter Jesus and be led by the Holy Spirit in whatever is going on in our daily lives. We’d love you to be part of that with us. If you like to know more about the Christian faith why not try the rejesus.co.uk web site. If anyone would like to come to either group and needs a lift, let Natalie know. You do not need to know your bible inside out, or be afraid of asking silly questions. We enjoy one another’s company, accompany one another on our journey through life.